As I walk in to a sunny apartment in downtown Toronto, I notice a beautiful view, but not much of a kitchen. The place isa hub of activity as I am warmly greeted by my friend, Dyshni, and she introduces me to her beautiful Mama, Jeya, her cousin whose apartment we are in and finally, Dyshni’s handsome boyfriend who is setting up video and taking photos. Now, this is my kind of set up. I am told to have a seat and taste some “Short Eats” which are beautiful home made potato and veggie Samosas. Also considered among these delicacies are Vadai, little crispy doughnuts made of white lentils, curry leaves, green pepper and onions. And to finish, and not to be left out, was a delicious savoury Massi Seeni Sambal bun, filled with Salt Cod. I love the name "Short Eats," and asked how it came to be. Dyshni told me that these are quick snacks that are eaten anytime. Some have them for a breakfast on the run, others as an after school snack or mid day break. I am also served a cup of sweet milky tea that is reminiscent of Thai tea, but that may just be my weird taste buds. Dyshni and her mother had begun to chop and prepare but not a thing was cooked before I arrived. With Sri Lankan cooking, like many Asian cuisines, the prep time is high with lots of herbs, spices and vegetables but cooking time is quick. Even with stewy things they are often small pieces, so it takes less than an hour and it does its own thing in a pot. The Portuguese invaded Sri Lanka and you can really tell in some of their dishes. Although though the fish is kingfish or mackerel they dry and salt it the same way. Dyshni was born in Canada as her young mother came here in 1988. Her uncle, living in Germany to escape the civil war, was first to arrive in 1985. After making enough money, he came to Canada and claimed refugee status because of the war. Like many newcomers to Toronto, King Street and its environs was home. As they worked and began to make money, they moved to the suburbs and landed in the Markham area. Now, like many looking for more space, the community is in Ajax. Tamil people are from the northern area of Sri Lanka with the main city being Jaffna. They remind me of the Quebecois and the people of Catalan, all fiercely loyal to a region, more so than the country surrounding them. With this comes a truly incredible regional cuisine which I learned about on this sunny Sunday. Curry, as we all know, means "sauce," and so we did foods with varying curries. I am not sure if you know this but Tamil’s like their food hot, and I don't mean temperature, although it is. It is also searingly spicy, insanely spicy, so much so that when my Jamaican Stepfather went to Sri Lanka on business and ate the food it almost blew off his head. I was very grateful this day that Dyshni and Jeya toned it down for me. The mother and daughter cook like dance partners, each moving in and out of each other’s spaces. Today, Dyshni was cooking the way her mother wanted to. Growing up in Canada and learning about healthy food, Dyshni often lowers the amounts of oil and salt and brings in even more vegetables to set own style of cooking. They have a little game where Dyshni will cook her way, and then test it on family members to see if it will pass. I learned that there is such a food as Milky Curry. It is made more of seeds like fenugreek, mustard and cumin with fresh coconut and coconut milk base unlike a more traditional curry that is made up of dried spices. In Indian cuisine each protein has its own spice blend, but not so with Tamil cooking. There is one blend that each family sort of tweaks to their own tastes and this is used on many dishes, like the chicken curry we had on this day. I loved that the chicken was cut into small pieces, but, what was even more interesting, was the addition of bone in pieces that are chopped up to allow the marrow and bones to flavour the sauce. 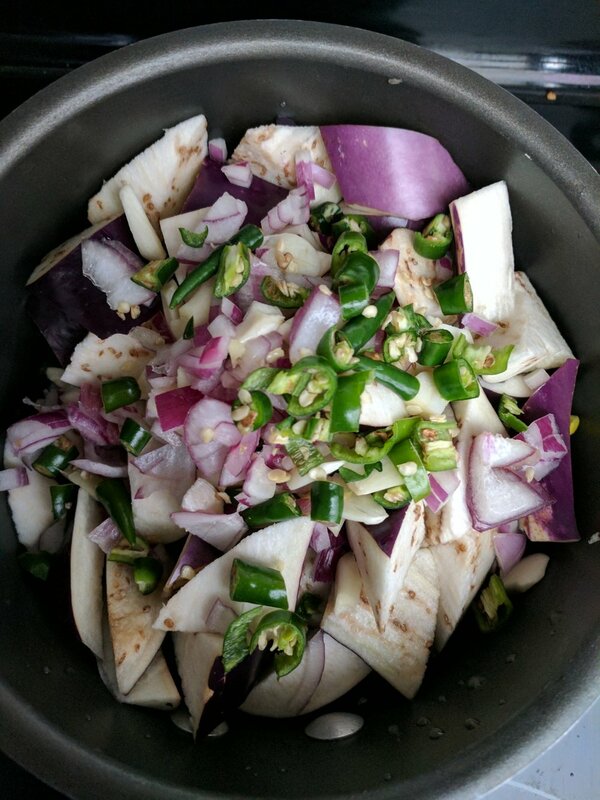 Sambal, a mixture of fresh coconut, red chili, green onion, red onion, garlic and lemon juice is a staple and served with most meals to flavour all the dishes for a fresh hit but mostly for the rice. Dyshni made the most incredible soft eggplant and another dish of spinach that were, for me, the highlights of the meal. Both were made in a very interesting fashion where you pile into small pots the main veggie and then top with chilis, garlic, onions and more. Then you virtually let them steam without stirring until the very end. You will get step by steps in the recipes below. I asked them if Sri Lankan people prepare, and enjoy, dessert, and for the most part the answer was yes, but mainly fruit and ice cream. There is a place in Jaffna called Lingan Cream House where they serve beautiful Jelly Ice Cream, fresh fruit Sherbet, served just like this. The stuff looks to die for and luckily because we have such a large Tamil culture we have Lingan Cream House at 6055 Steeles Avenue East in Scarborough. For religious reasons, Tamils do not eat meat on Thursday and Friday. What is really cool, and is similar to Kosher Jews, they have separate utensils for meat and vegetarian foods. Do not miss trying some of these dishes below. The heat has been modified so add more if you are brave. Marinate chicken with mild or spicy curry powder. Add mustard seeds, fennel seeds, cumin seeds, fenugreek seeds and gently wait until the seeds start popping. Be careful not to burn it! Mash tomatoes with the rest of the ingredients in the pan and then add chicken pieces. Cover and cook over medium heat until chicken is nearly cooked through. Add water if you want more gravy, if not, open the lid and cook uncovered. *Garam masala: equal parts fenugreek seeds, cardamom, cinnamon stick, cloves are dry roasted and then grounded. Let it cook covered over medium heat. Remove from stove and serve! Check if it’s done from one side, if not allow to cook more. I prefer my omelettes slightly brown and not yellow so cook it for some more time. Flip the omelette other side and cook uncovered. Once cooked from both sides, transfer it to a plate to serve.